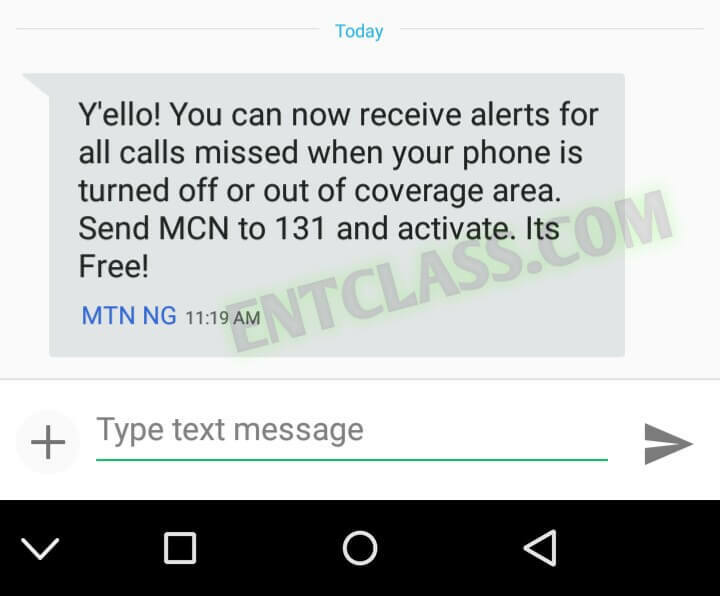 MTN has launched a new feature that allows you get Missed call notification even when your phone is Switched off or out of service. Other networks like Etisalat has already been running this service, and i could remember getting a text message of the calls i missed when my phone was down. This is an interesting service you need to activate on your MTN line, as you will receive text message notification of the numbers that called you when your phone was down or probably when out of coverage. If someone tries to call you when your phone battery is down or when you are out of coverage, you will get a text message notification when you turn on your phone. The text message will contain the phone number(s) that tried calling you. Anyway, say hello to MTN MCN, a service that makes it possible for MTN customers to get alerts for missed calls whenever their phone is not reachable. Incase you don't know the full meaning of MTN MCN, it simply means MTN Missed Calls Notification. Below is an official message from MTN Nigeria in regards to this development. Y'ello! You can now receive alerts for all calls missed when your phone is turned off or out of coverage area. Send MCN to 131 and activate. Its Free! To get missed call alerts even when your phone is switched off, sms MCN to 131. It's free according to the text MTN sent. That's all friends. If you have any problem, kindly comment below and don't forget to share this post. How to opt in to MTN Missed Calls notification. 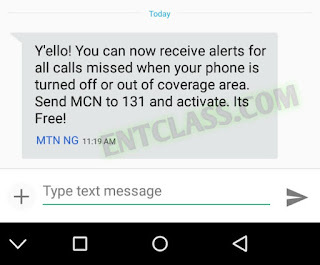 MTN MCN is a service that allows you get sms alerts of calls you missed. Activate MTN MCN. Subscribe to MTN missed calls sms alerts. It's free of charge. I no need am. Person go do an now, MTN go add other SMS join. Before you know it, credit don dey disappear for wetin u no sub for. Interesting, thumb up to mtn nig. I have read and tried all the method, including sending an SMS, SET 01 to 100, but the response is the same, message rejected. I do not know whether the service is only for new SIMS. You mean, you were trying to activate MTN MCN? And it weren't successful? Good idea, thanks for sharing this with us.